5th and Spring's Celia commented on previous post about the chase; she also heard the 'copters and thought it was filming, of which she wasn't notified (again). I went over to see if a FilmLA website pilot program that once posted closures was active again. It was down for a few months. It's now back up. 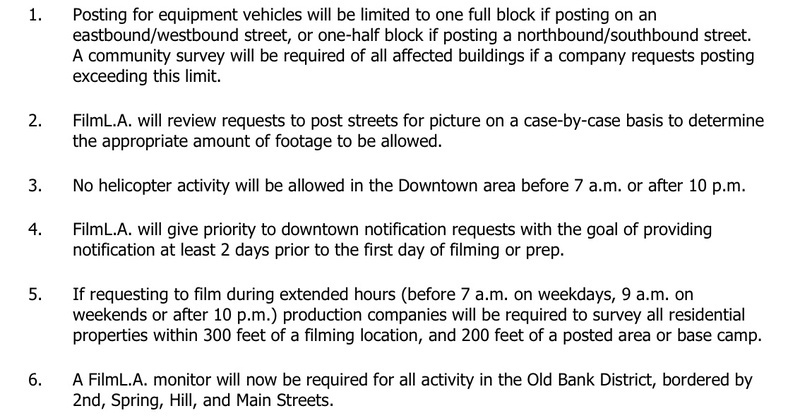 There is a spot where you can get "up to 72 hour notice" of filming with notes like: "FULL CLOSURE 5th St. from Spring St. to Main St. 4/25/07, 4/26/07, 9:00a-3:00p"
A FilmL.A. Monitor will now be required for all activity in the Old Bank District, bordered by 2nd, Spring, Hill, and Main Streets. I think it has something to do with Downtown being the 3rd "bloggiest" neighborhood. ADD: Eric is all over it, too. ...and the southern boundary would be...?? ?